Have you seen lots of "31 days of ... " series on blogs? I have and thought it was a great idea to blog every day for a month on a particular topic. I recently discovered that this idea originally came from The Nester (well maybe others did it before her but she's certainly made it popular the last few years). She's hosting a 31 Days blogging party for the month of October. Read this post to see how this all came about and check out some of the 700+ bloggers who did it last year. Now if you've been following my blog you know that consistency in posting has not exactly been my middle name :) So when I first heard about the 31 Days idea I thought it would be great to do, but I knew there was no way I would keep up the pace of writing a blog post every day for a month on an organizing topic. So, I dismissed the idea of doing a 31 Days blog series. 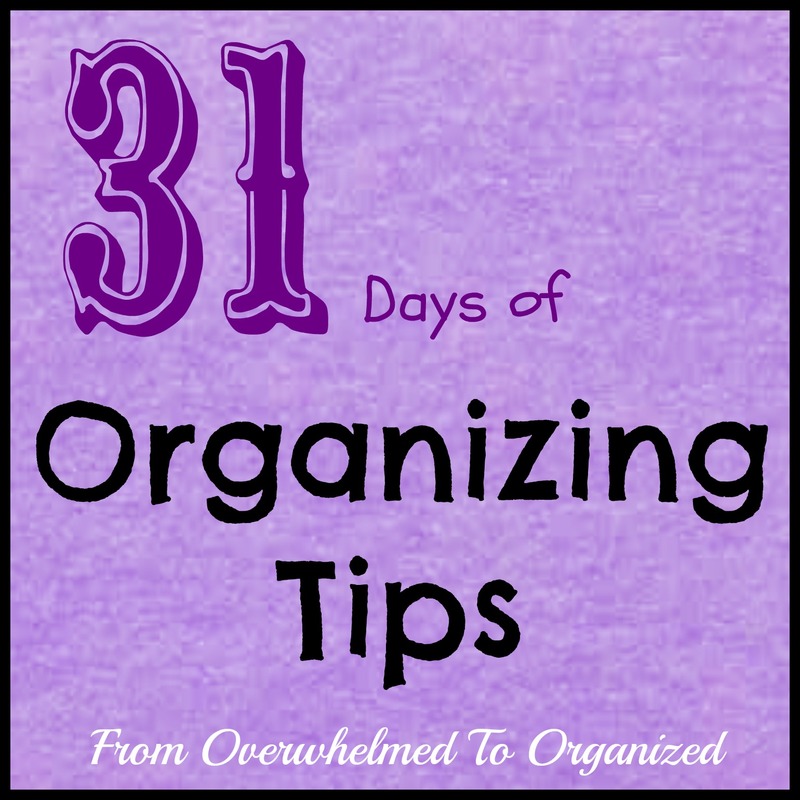 But, one of my goals a few months ago was to share more organizing tips with you so you could implement them and I could help you go from overwhelmed to organized. And although I do share tips and ideas on Facebook and Google+, not all my readers follow me on social media. I will share an organizing tip, strategy, product, or inspirational idea each day on the blog for the month of October. These will be things that I've found on the Internet that I want to pass on to you. I'll be adding these organizing ideas to my Pinterest boards throughout the month too so if you're on Pinterest you can re-pin them. If you're not on Pinterest you'll always be able to find these ideas back on the blog because I'll put a tab for the series that will list all 31 posts. This is going to be a challenge for me but I think the accountability of a series like this will motivate me to keep on track and post every day for 31 days. I look forward to sharing some great organizing ideas with you and helping you go from overwhelmed to organized! I'll update this post each day with links to all the new posts so you can keep checking back here to make sure you don't miss any. Or subscribe to my blog by email or RSS (links are on the right) or follow me on Facebook, Google+, or Pinterest to make sure you never miss a post! Are you doing a 31 Days series? Leave me a comment if you are so I can follow along with you too! 31 Days of organizing is a great idea so I will happily join you on this one & thank you !! Hello! I'm also doing a 31 day series: 31 Days to Building a Cleaning Routine. I'm excited to read yours. I have started following your blog by email! Good luck! Thanks Betsy! Your series sounds like something I really need. I love organizing but am not a fan of cleaning :) So I'll be following along with you. Good luck to you too! I am also using the 31 Days series to get me back into a better, consistent blogging routine, and I'm one that is usually more overwhelmed than organized, so I'm looking forward to checking in often this month. Thanks for taking the challenge! I think the challenge will be really good Linda! I'm hoping the accountability will help improve my consistency. Seems like that's why a lot of bloggers join in :) I look forward to seeing your creative posts! I'm loving your series Hilda. Your tips have been great. Thank you for linking up to my Our Favorite Things Link Party. You're welcome Karri! Glad you're enjoying the series.